Colin sent photos of the siphon - you can see the slats and the general state of repair before Fred's restoration group get at it. It's a long haul going all the way round it! "Went down to help on the Siphon Sat 7 We first fixed the light which had not worked for a long time. We then tried the slats for the windows in the new post Fred had made they were quite a way out so we took the post off again and moved it up a bit and the slats looked great we were just thinking what to do next when Carriage and Wagon guys came and could we be ready to move in an hour ok so we strapped everything down and within the time frame the coach was moved it was quite strange to see the steps still there with no coach we spent the rest of the day tying down the sheeting in a gale force wind then I took Fred and some chairs down to Toddington quite a day!. The only thing we forgot to secure in the move was the table with the Microwave on it on castors so it went walkabout no damage done." Bruce & Gilbert began by playing with the tender - Bruce attempted to open up the hole in the frame for the final pin to pass through horizontally. He gave up. The driving wind & rain were just too much. However, this is the last one to be done. Talking of bolts (which we almost were), Gil bought two different lengths (because of two different thicknesses of plate to pass through) and the shorter ones were fully threaded. The longer ones are only part threaded and have an unthreaded portion inside the bracket casting and supporting cross-member. Indeed Bruce is having to extend some of the threads otherwise the threads will not even reach through. The railway is not happy about us using the fully threaded bolts. Mark Y came and discussed the situation with Gil & Bruce. Gil explained that it is not possible to buy what the Railway say, off-the-shelf. 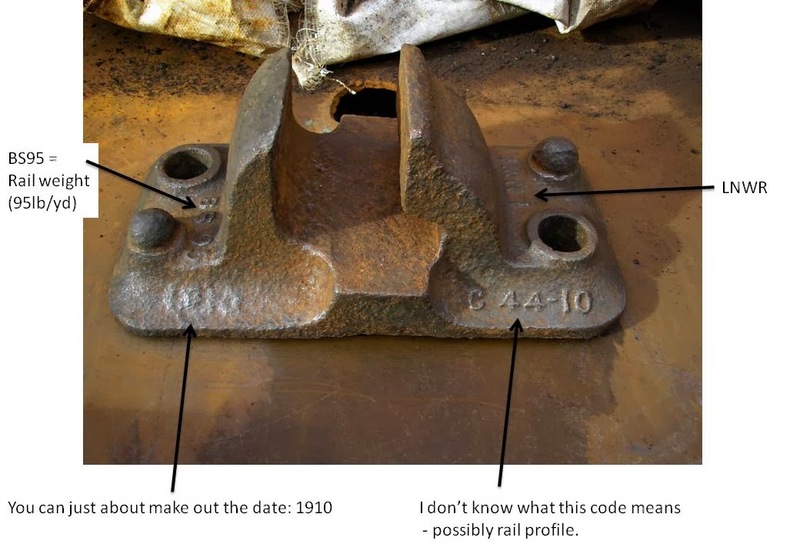 Mark Y stated that if such is the case, then the Railway (workshop) will do whatever is necessary to form bolts to the Railway's specification .. as a priority! Mark Y (and Carpo) also confirmed that using the R-clips rather than split pins is acceptable to the Railway. Gil has gone away with a new shopping list! Anyway, Bruce continued to extend threads and drill holes for R-clips on those bolts that are acceptable. Just after tea break, we had a power loss. Dixie went to investigate (him being an electrician) and it was the whole site dead. Lucky it was after tea break! It did occur to me that if the power was off for an extended period, we were stuck there because the gate wouldn't have opened! After 15 minutes, the Grand Universal Provided let there be light, and we pressed on. Dixie and I painted rail chairs. Dixie had the pleasure of doing six black bottoms, three black tops and 3 GNR green. I did lettering on 3; 4 BR(W) green top coats plus 2 BR(W) red undercoats. The sun began to shine at 3 o'clock, but we went home anyway. As we left the yard, a wheelbarrow was hurtling in an easterly direction, all on its own. As it was heading for our tender, I though it prudent to chase after it and return it to the wheelbarrow stable .. and make it stable. 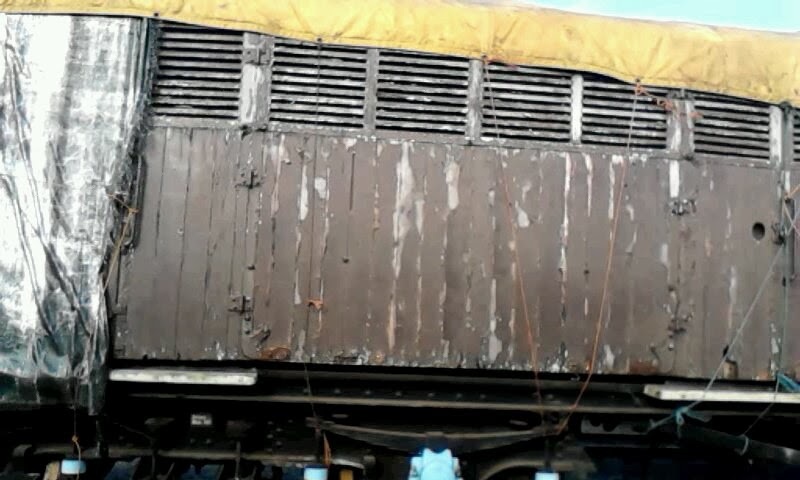 We had discussed pushing the tender close up to the workshop door in case that made it less likely to go ride-about on its own. But we didn't bother. 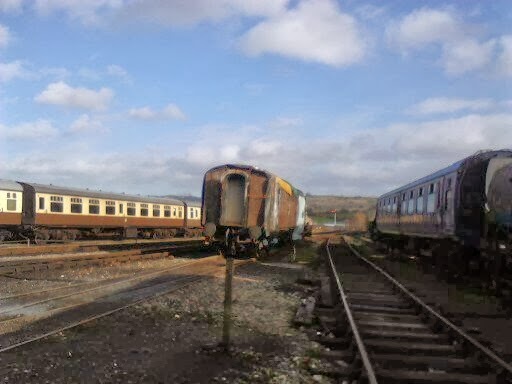 Oh, and The Railway agreed that we can have 2807 facing south when she comes back. This will mean also turning the tender around, of course, otherwise it would be a struggle for the fireman to get at the coal! Gilbert, Bruce & David pressed on with the tender. It's amazing how much time it is taking to get these bolts done to spec. Bruce spent most of the day lining up each individual bolt in his jig and drilling the hole through it for the split pin. David spent much of the day with a die, cutting the thread just about three more turns on each bolt. Gil was under the tender. Mike [Loco Dept] joined him after lunch, and they worked on fitting the brackets, the hangers and the brake shoes. The front pair are completed and functional (so the tender won't blow away). The rear ones are fitted but not yet functional because they need the operating rod fitting that connects all of the brakes. The centre pair are not yet fitted. Next Weds we need to fit the centre ones, and get the whole brake system functional. Reason? Because next Friday the railway is going to turn our tender round … when Dinmore Manor arrives. Back to today: Mike refilled the axle boxes with oil. 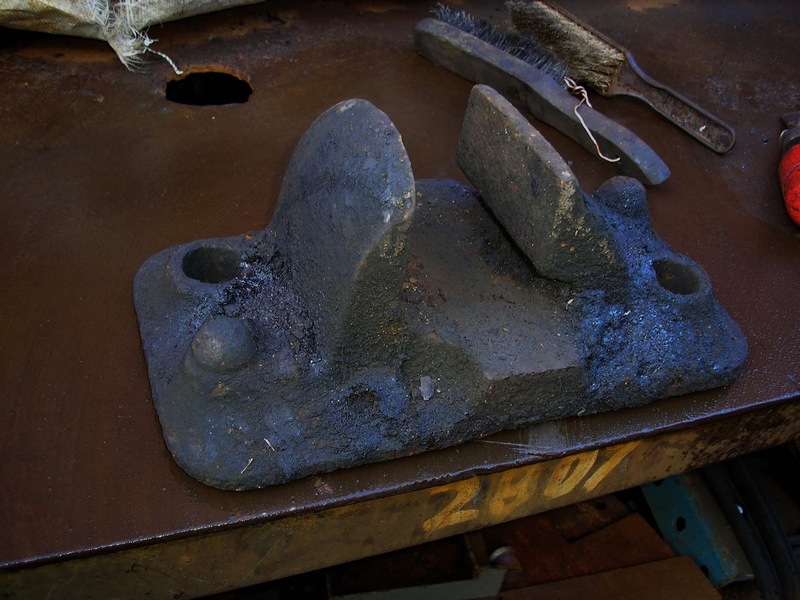 They didn't need a changing particularly, but Bruce had drained them when the thought was that we would need to jack the tender up to carry out this work on the brakes and that meant that the underkeeps would have to be removed .. whereupon the oil would escape on its own. I pressed on with chair cleaning. I have been sorting out pre-World War One chairs to do a special one-off offer for the May gala (all because of the WWI theme). Being 100+ years old, these chairs are generally a tad filthy. See attached before & after photos. They'll get a couple of coats of paint and the lettering will be picked out, of course. I found some GWR in addition to the GNR and LNWR ones. Having exhausted the supply of these oldies, I had the usual delight of painting their black bottoms and black holes.